Recently, I came across the app named “Lose Weight without Dieting”, initially I was very much stringent to install this app, but after using this app I can say that this app withstands its name. There are lot of apps available online which promises a lot about your health and fitness, but they are not worth to use. But, this app has different kind of features and the effective ones. 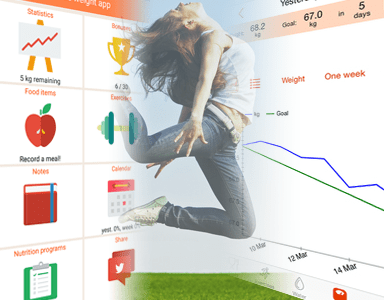 Lose weight without dieting is an Android app easily available in the Google Play store. This app allows you to add the food and drinks you consume on daily basis and exercises you perform every day and store it in its database. Then, it gives its advice to tell that whether you are going in the right direction or not. So, it helps you to lose your weight without giving you the feel of dieting at all. When you install this app, you will be taken to the tour of this app, where it will show you the benefits of tracking of the food you consume and exercises you do daily. And then, you have to enter some of the necessary information like age, gender, weight, lifestyle, and others. Then, you will be taken to the main menu page, where it will give you hints to navigate through the Dieting apps. Then, it will redirect you to the page where it will ask you lot of things like what you had in your brunch, meal and breakfast. Also, here you will get the two options either tweak the data and add on your own or add the pre-entered meals such as rice, dal, and any kind of Indian dishes which are available in the database. So, when weighing yourself, tracking what progress you made so far will lead you to lose some weight. So, this app has got all the features to track the progress you are making, counting the calories you burnt and giving you the advice to bring back in the right shape and weight. This app has got the cool features where you can chose the pre mentioned exercises to enter what exercise you have done so far in the day. This app has got easy to use interface and it works really well, but it only works on the data you enter. So, you have to take the pain to enter the data and then track the progress. Also, to remove the ads you can purchase the premium version of this app. But, overall the app withstands its name and delivers what it promises. Know Your Android Version in 10 seconds!! Not clear if you can track consumed calories compared to burned ones.